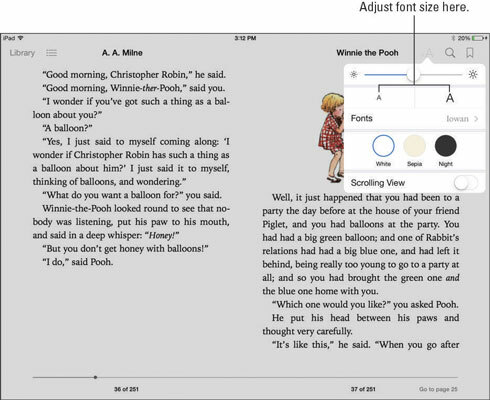 With a book open, tap the Font button. It sports a small letter a and a large capital A, as shown in the figure. In the Font dialog that appears, tap the small letter a button on the left to use smaller text, or tap the button labeled with the capital A on the right to use larger text. The list of fonts, as shown in this figure, appears. This list may vary slightly if Apple adds more or you’re using a language other than English on your iPad. Tap a font name to select it. The font changes on the book page. Tap the Theme button and then tap Sepia or Night to choose the theme you want to display. If you want to have a sepia tint on the pages or to reverse black and white, which can be easier on the eyes, you can change from the default White setting to one of these. 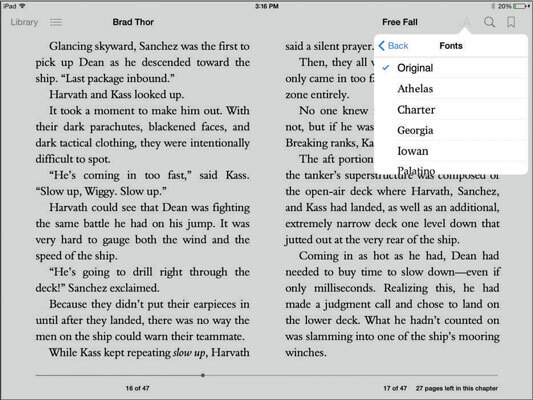 Tap outside the Font dialog to return to your book. Some fonts appear a bit larger on your screen than others because of their design. If you want the largest font, use Iowan.